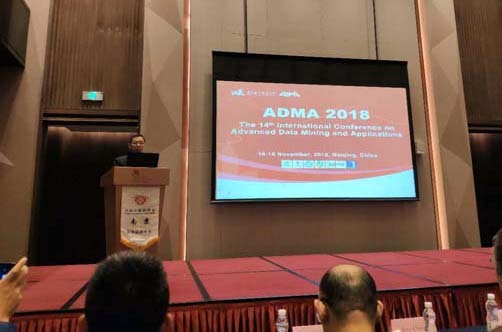 I have recently attended the 13th International Conference on Advanced Data Mining and Applications (ADMA 2018) in Nanjing, China from the 16th to 18th October 2018. In this blog post, I will give a brief report about this conference. What is the ADMA conference? 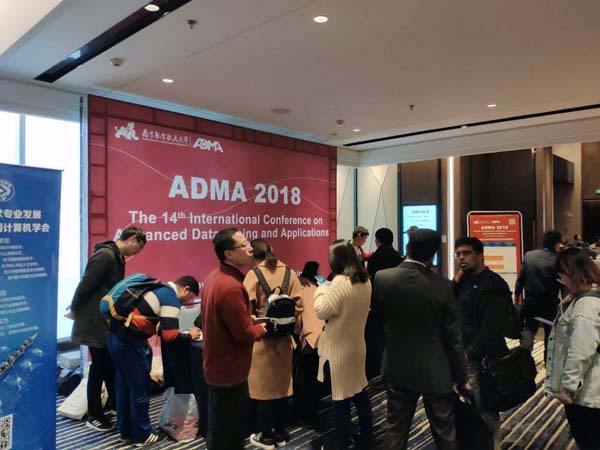 ADMA is a conference on data mining, which is generally held in China, and sometimes in other parts of Asia. It is a overall a decent conference. In particular, the proceedings are published by Springer in their Lecture Notes in Artificial Intelligence, which ensures a good visibility of the accepted papers, and all papers are indexed in EI and DBLP. One of the particularity of this conference is that it has a focus on applications of data mining. The ADMA conference has started in 2005 and was held every year until 2014. I have attended ADMA 2011, ADMA 2013 and ADMA 2014, and also had a paper in ADMA 2012. In recent years, I had submitted papers to the ADMA 2015 which was cancelled. Then, since ADMA 2016, the conference has been held every year, with quality papers, and this year, I am glad to be back at attending ADMA. 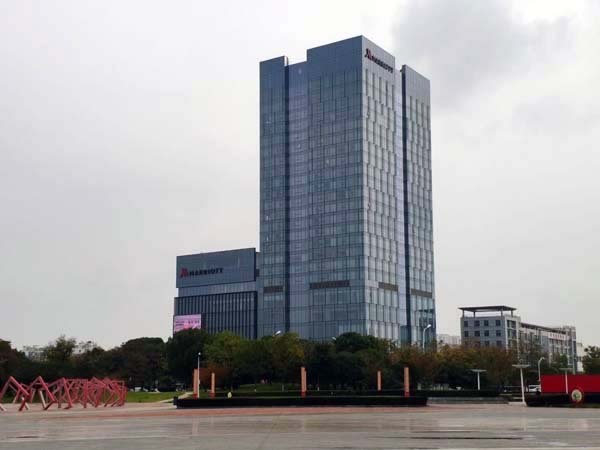 The conference was held at the Mariott hotel in Nanjing. Nanjing is the capital of the Jiangsu province in China. Nanjing has a long history and has been the capital of several Chinese dynasties. There are many things to see, and it is close to some other popular cities like Suzhou. The main conference was held on two days, while a third day was used for some doctoral student forums. For the main conference, there was two keynote speakers in the morning of each day. Then, in the afternoon, there was paper presentations. 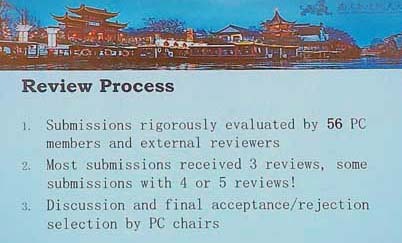 Due to this tight schedule, all papers were either selected to be presented in 10 or 15 minutes (including the questions). In the evening, there was a reception and a banquet on the first and second day, respectively. On the first day, it was conference registration. We received the conference program, badge, pen, notebook and a laser pointer as gift. The conference proceedings was on the USB of the laser pointer. Then, there was a brief introduction by some high ranking representative (dean?) of the Nanjing University of Aeronautics and Astronautics, which organized the conference. Then, the local organizers gave some information about the conference. And we took a group picture. product recommendation, where customers, preferences and purchase products and locations are put in a graph model (a multidimensional graph). planning the delivery of food and products to homes in an efficient way. 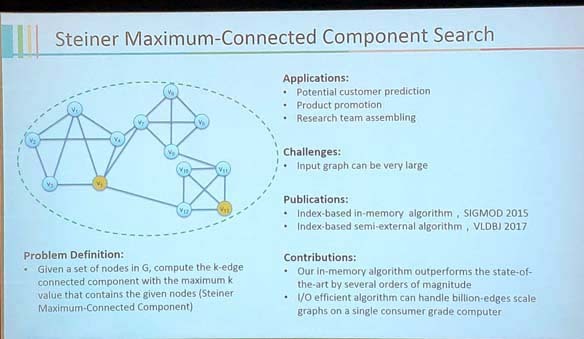 Then, some key challenges for graph analysis have been presented: define a new computing platform, analytic models, processing algorithms, indexing techniques, and processing systems (primitive operators, query language, distributed techniques, storage, etc.) for graphs. In other words, we need to define new models and software specialized for analyzing graphs. 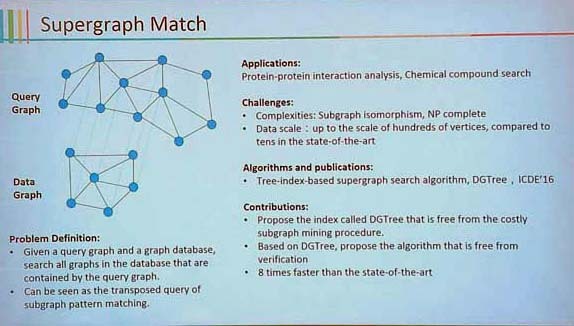 Finally, several problems related to graph analysis were briefly discussed. 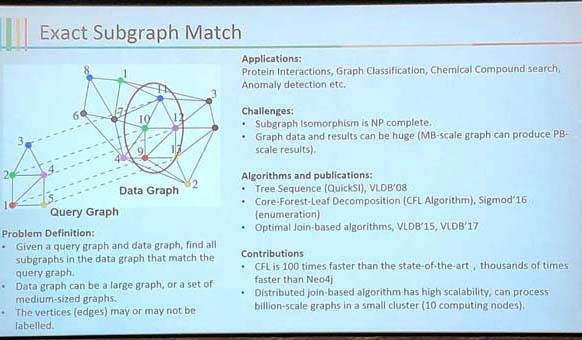 Overall, this was a good keynote talk as it gave a good and up-to-date overview of several graph analysis problems. 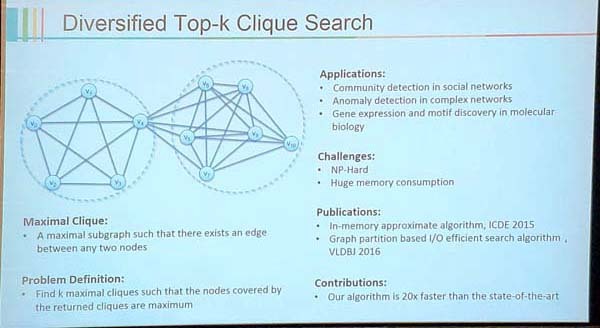 The talk was about using stacked auto-encoders for resource allocation in wireless network. The main resources are channel, transmission power of a radio station (power allocation) and antennas (shared by many users – how we allocate to many users). The speaker was some specialist from the field of communication. In theory, this should have been a very interesting talk. But a problem with this talk was that the speaker spent most of the time explaining basic concepts of machine learning, and ran out of time before talking about how he was actually using deep learning for resource allocation (which was supposed to be the key part of the talk). Fournier-Viger, P., Zhang, Y., Lin, J. C.-W., Koh, Y.-S. (2018). Discovering High utility Change Points in Transactional Data. Proc. 13th Intern. Conference on Advanced Data Mining and Applications (ADMA 2018) Springer LNAI, 10 pages. Then, in the evening a buffet diner was offered at the Mariott Hotel, which was a good opportunity for discussing with other researchers. On the second day, there was more keynote and paper presentations. Then, there was a banquet at the hotel of the conference. It was an interesting conference. 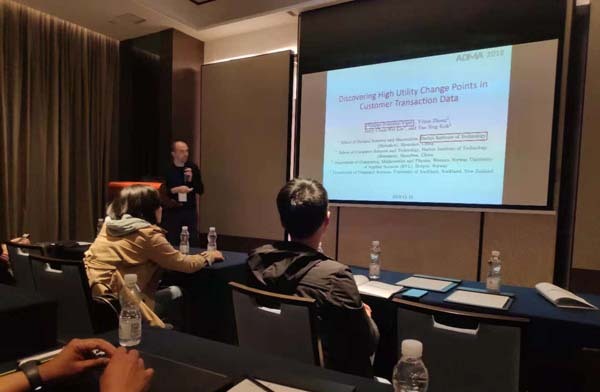 Although it is not a very big conference, there was some good keynote speakers, and I had some very good discussions with other researchers. Looking forward to the 14th ADMA conference (ADMA 2019 conference) , next year.